Another great feature of the frame are the dual 4" polyurethane wheels. Almost every bag has wheels, but these are mounted vertically to easily handle being dragged up stairs or over curbs. They also absorb shock, roll easily on most any surface. Two feet are built-in to keep the bag stable when not in motion and are constructed of Nylon 6 material. It's super durable yet gentle on easily scratched flooring. These wheels also have a cool flashing design with embedded LEDs. They look great and will keep you safe when wheeling your bag at night. Carrying around your school books has never looked so cool! 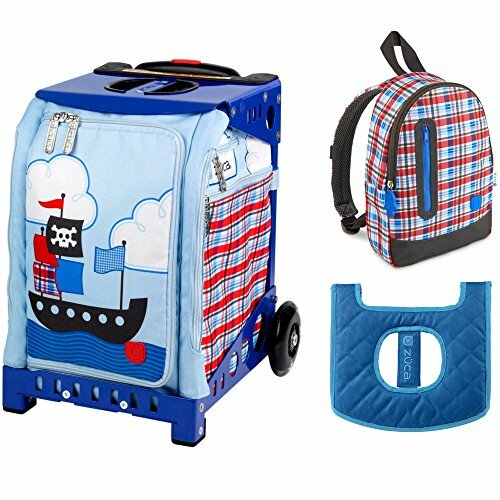 With the Mini Backpack, Zuca has constructed a schoolbag with style and amazing durability. It’s also extremely comfortable with adjustable, padded straps and a padded mesh back plate. You get plenty of room for your books and other supplies, thanks to the large main compartment. The front zippered pocket is perfect for school ID, cell phones or anything else you need quick access to.